This novel has all the elements a reader could want: danger, romance and a "good vs. evil" conflict - all wrapped up in deliciously Gothic trappings. Seventeen-year-old Natalie Stewart is unable to speak due to a childhood trauma, so has spent the last several years at the Connecticut Asylum where students are blind, mute, deaf or some combination of the three. She has now graduated and returned home to live with her father who loves her but is at a loss as to what should be done with her due to her "illness". Natalie has learned that "for unfortunates like me, firstly, a girl and, secondly, a mute girl, life is made up of different types of prisons...". However, her prison is unlocked when a mysterious painting is brought into her life; a painting that seems almost alive. This is an AMAZING novel guaranteed to have readers up far past a reasonable bedtime. Since Natalie does not speak the story is told in a series of journal entries which gives this text an intimate peek into the main character's thoughts and emotions. Hieber has done an solid job of creating characters of substance, even those that only walk across a few pages. The reader is drawn into the society and city of New York in the 1880s with all it's texture and grit. Anyone familiar with New York City will recognize landmarks such as the Metropolitan Museum of Art (just a few years old at the time of this novel) and the Angel of the Waters in Central Park. 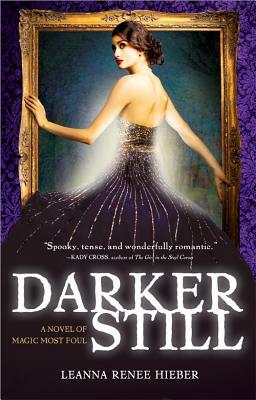 While the homage to Wilde's Picture of Dorian Gray is evident, Darker Still is a wholly different novel that will resonate with readers. Highly Recommended.